This Church Corridor Furnished Rental is in a brand new furnished condo with ample natural light and upgraded interior fixtures. 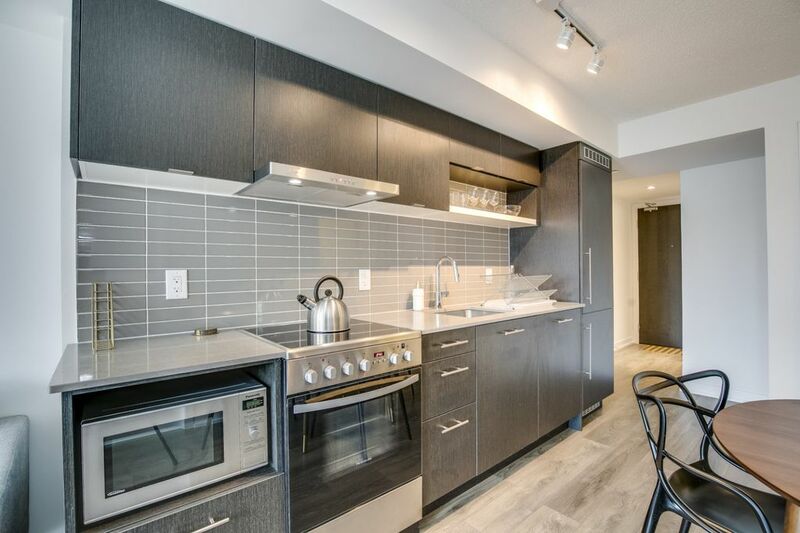 Located in a newly built condominium tower at College and Yonge Street, this suite offers a quiet private suite steps away from the exciting areas of Yonge and College and Church Street. Ideal for a corporate housing Toronto stay, you can enjoy this furnished rental apartment with the new contemporary furniture and our personal service. The bedroom offering a clear view toward downtown Toronto and Church Street. The suite is 650 square feet in size, features sleek camel brown hardwood floors, floor to ceiling windows throughout providing ample natural light. The furniture has primarily been provided by CB2 and Structube, for a cool, modern living space. Stunning white granite kitchen counters, stainless steel appliances, and stunning modern natural wood cupboards covering for the open kitchen appliances.